Participants mostly aren’t concerned with how their information is used, although around one-third worry that their data might reduce study participation, could be used for marketing, or might be stolen. They also don’t trust drug companies. 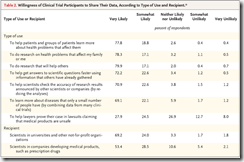 Previous studies involving biospecimens and EHR data found that patients were less willing to share, which is a seemingly contradictory finding since clinical trials data is a usually a superset of EHR data. 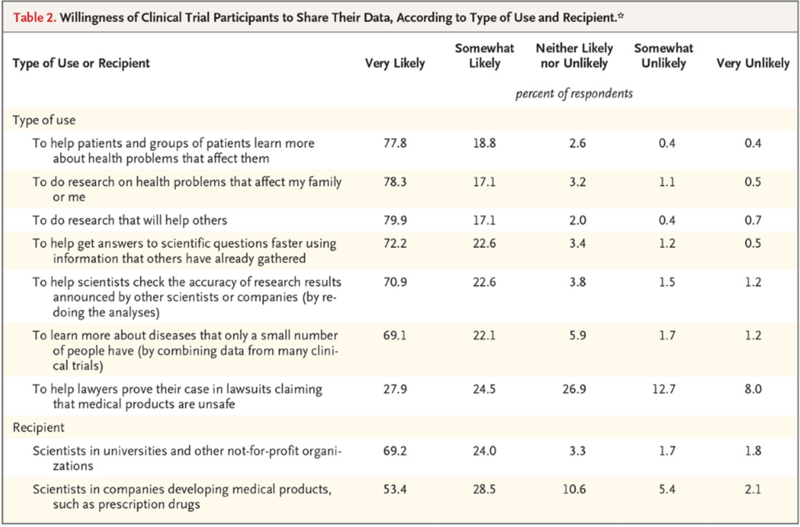 The authors speculate that clinical trials participants trust researchers and are enthusiastic about contributing to their scientific efforts. From Former Insider: “Re: University of Iowa Health Care. Never had any internal controls. The leaders were given $30 million to spend and spend it they did! Everyone is being let go. 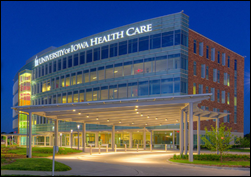 A tremendous waste of Iowa taxpayer dollars.” UIHC says it needs $7.5 million to exit the UI Health Alliance and dissolve its ACO, which is operated as a separate non-profit, UI Health System. Within UI Health Ventures is Community Connect, a 50-FTE operation that is implementing EHRs in seven critical access hospitals and clinics. A previous audit found that Community Connect had poor data controls, inaccurate patient scheduling and billing, and sloppy financial reporting, which the university still hadn’t corrected six months after the six-month deadline passed. Community Connect’s Epic implementation work will be transferred to UI Health Care’s IT department, which UI Health Care CIO Lee Carmen told me in November back when the decision was made. Wednesday was a busy day on the HIStalk server as I got the Athenahealth news out before anyone else, even the Boston Globe, meaning that over 500 folks were online simultaneously for a couple of hours but with no ill effect except some minor site slowdowns. Page views for the day ended up at over 12,000, which isn’t hugely higher than normal, but it’s the burst of activity that sometimes causes a “server not responding” error at the peak. I had some adjustments made a few weeks ago (after the VA contract news) and that might have helped. The all-time high remains at 17,327 page views on July 30, 2015 when the DoD announced its Cerner decision and even I couldn’t get in that day. Athenahealth shares took a sharp turn upward Wednesday on the news of Jonathan Bush’s resignation and the company’s plan to explore strategic alternatives. ATHN shares rose 4 percent Wednesday and another 1 percent Thursday. HP will lay off between 4,500 and 5,000 employees by 2019 as part of its ongoing restructuring plans. Meditation app company Headspace launches a new subsidiary that will focus on developing FDA-approved, prescription-strength meditation apps targeted at specific medical conditions. Founder Andy Puddicombe became a Tibetan Buddhist monk and trained with the Moscow State Circus before starting the company in 2010. A New York bankruptcy court selects MTBC as the “stalking horse” primary bidder for the assets of Houston-based Orion HealthCorp, which offers revenue cycle services, practice management, and group purchasing. You might be appreciating the irony of a revenue cycle services vendor going bankrupt, but there’s more to the story – it was part of Constellation Healthcare Technologies, whose since-fired CEO Paul Parmar and his fellow executives have been charged by the DOJ for part in an elaborate $300 million fraud scheme involving phony acquisitions. He claims he earns $1 billion per year and he lives in a 39,000-square-foot mansion worth a few dozen million. Steve Wretling (DaVita) joins HIMSS in the new role of chief technology and innovation officer. Act.MD names Amy Vreeland (LifeImage) as chief commercial officer. Altruista Health appoints Brad Kuebler (Agiliko) VP of technology operations. Regional physician network Georgia Health Select will implement population health management software from EQHealth Solutions. Greater Ormond Street Hospital for Children in London contracts with Hyland Healthcare for its OnBase content management technology. 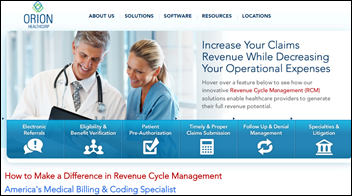 Landmark Hospitals (FL) chooses RCM software and services from HCS Interactant. Ballad Health (TN) will implement Epic in a two-year process that will kick off in 2019. In the UK, Royal Devon & Exeter NHS Foundation Trust officials sign off on an Epic implementation that will begin in September. 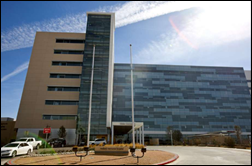 Midland Health (TX) goes live on Cerner. Patientco adds customizable SmartFinance patient financing options to its line of payment technologies and services. DrFirst adds pharmacogenomic test ordering to its Rcopia e-prescribing system. The DOJ charges the CEO of a chain of Midwest pain clinics and laboratories, along with four doctors, for running a $200 million fraud scheme involving the prescribing of 4.2 million dosage units of medically unnecessary opiates to Medicare beneficiaries who were either addicted to the drugs or selling them on the street. DOJ says the doctors also required patients to consent to receiving the maximum number of injections that Medicare would pay for. CMS stopped payment to one clinic and a lab when it found that 100 percent of their claims were not eligible, after which it says the defendants created new shell companies and swapped out signs on the company doors so the billing could continue. 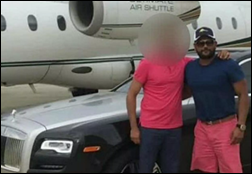 Prosecutors say 37-year-old CEO Mashiyat Rashid lived in a $7 million mansion, drove a Lamborghini and Rolls Royce Ghost, and wore expensive designer clothes. Federal agents had him under surveillance last year when he withdrew $500,000 in 100-dollar bills from the bank, which his lawyer says is reasonable because he’s a venture capitalist. A presumably independent security researcher alerts consumer DNA testing company MyHeritage to an October 2017 data breach involving 92 million customer email addresses and passwords stored on an unauthorized server. The company may soon face scrutiny from the FTC, which is investigating the data privacy practices of competitors Ancestry.com and 23andMe. 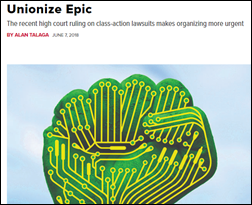 The Madison, WI hippie weekly says its time for Epic employees to unionize following the Supreme Court’s ruling that forcing employees into arbitration over labor issues and prohibiting them from filing class action lawsuits is legal. It adds that a union could also fight the company’s famous non-compete clause that prevents them from working at any Epic-using site, not just the company itself. Over half of the 4,000 patients surveyed by University of Michigan Medical School researchers report that a physician’s attire is important and one-third admit it influences their level of satisfaction. 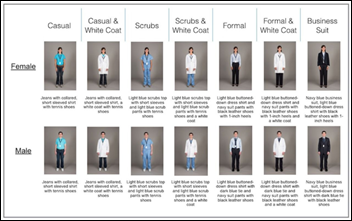 Most prefer a white coat no matter the care setting, professional role, or gender of the provider. 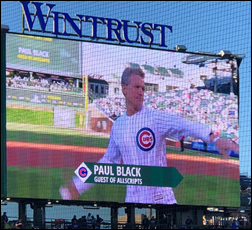 Allscripts CEO Paul Black throws out the first pitch for the Healthcare Professionals Night at Wrigley Field for the Cubs vs. Phillies game. Not to be nitpicky, he’s not a healthcare professional even though Allscripts paid for the promotion. I wrote about the tiny California town whose one-bed hospital would either be sold to the only private investor who wanted it or be closed. 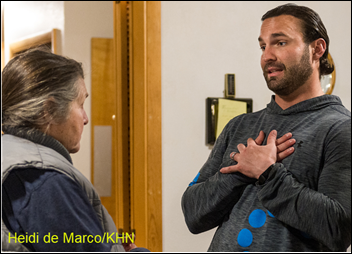 They voted to sell Surprise Valley Community Hospital to 34-year-old Beau Gertz (above, right), the owner of nutraceutical and lab companies who plans to run his lab and telemedicine bills from all over the country through the hospital to earn higher payment. The hospital tried that previously with another company that left them high and dry. Apparently the main claim to fame of Cedarville, CA is that it’s the last chance to gas up on the way to Burning Man. The New York eHealth Collaborative expands patient care alerts for hospital admittance, discharge, and transfer across the state’s eight regional HIEs via the Statewide Health Information Network for New York. Stanson Health’s Caden (Clinical Advisory Delivery Engine) goes live on Epic’s App Orchard. LiveProcess publishes a self-assessment quiz on the CMS Emergency Preparedness Rule. LogicStream Health receives the 2018 MedTech Breakthrough Award for Clinical Efficiency Innovation. Meditech will exhibit at the 2018 Nurse and Home Care Forum June 13-15 in Foxborough, MA. Netsmart will exhibit at the I2I Center for Integrative Health Spring Policy Forum June 11 in Raleigh, NC. DocuTap wins a MedTech Breakthrough Award for Best EHR Service; its Clockwise.MD technology wins in the Best Overall Patient Engagement Company category. Kyruus wins a MedTech Breakthrough Award for best patient scheduling solution. Leidos Health will develop health IT for Maxim Healthcare Services and its post-acute care workforce. Glytec incorporates Smart Meter’s iGlucose diabetes care solution with its Glucommander Outpatient software. Why isn’t Paul Black a “healthcare professional”? He’s not a Doctor? Do we think that Allscripts is not a “healthcare” company? Or is Mr. Black just that unprofessional? You aren’t a healthcare professional just because you work for (or run) a healthcare-related company and “professional” is not synonymous with “employee” or even “executive.” The word “professional” actually has a real definition that few people meet even though they like the way it sounds better than “employee” and thus misuse it a lot, and certainly being a healthcare professional usually refers to licensed people who meet the qualifications. Based on that, Paul would not have qualified for a discount or recognition at the game he attended had Allscripts not been footing the bill, and I guarantee he wouldn’t dare characterize himself as a healthcare professional when trying to sell something to actual healthcare professionals. Would somebody CPHIMS Certified by HIMSS meet your standard to be a “healthcare professional”? How about Jonathan Bush – a salesperson, but also a certified EMT (albeit currently unemployed in all capacities)? CPHIMS alone, no since it’s not even an actual job, just a paper credential achieved by passing a test. EMT, arguable given what little I know about it, but if it requires continuing education, has an oversight body, and has its own body of professional literature and ethical standards, then yes at least as a professional (whether “healthcare professional” or not is a head-scratcher, but I’d vote yes if the person is actually working in that role and not just sitting on old but still-valid credentials). Yes, yes I do think it’s a coincidence.